Tips on How to Get Rid of Small Pimples in Your Cleavage! Sweat, stress, allergic reactions to skin lotions or new laundry detergents can cause development of small pimples between your cleavage area. In general, there can be many causes why do we get pimples or acne in our cleavage. 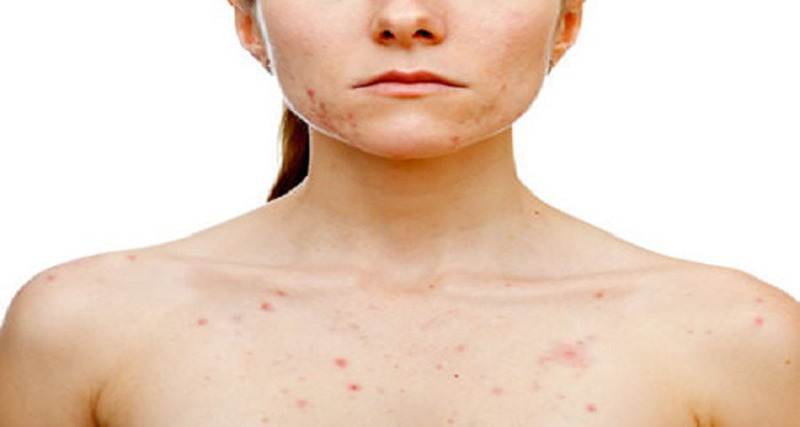 As we mentioned before, some of the top causes for this condition are: sweat, stress, allergic reactions to skin lotions or new laundry detergents causing irritation and rashes in the delicate cleavage area. You can treat cleavage pimples in the same way as those on the face. You should use antibacterial lotion that helps clear your pimples. Dip a clean cotton ball in the lotion and apply gently on your cleavage in the morning and at night, before going to bed. Do not apply perfume during cleavage “treatment”. Avoid wearing polyester clothing and wear only natural fiber clothing to absorb perspiration while letting your skin breathe. Do not touch or squeeze cleavage pimples. You’ll only make things worse and cause an outbreak of new ones in your cleavage. Nourishing your skin begins from the inside with the foods you eat. Stop eating unhealthy foods, especially sweets, and instead include lots of fruits and vegetables in your daily diet. Finally, do not forget to drink a lot of liquids!